Endives are bitter, leafy vegetables. In the States, you see them often in gourmet magazines but never really on the table (at least for my Asian immigrant family). My kind of salad was iceberg or the occasional kale. Imagine my surprise when I started eating more greens with flavor. While endives aren’t extremely bitter, my first taste welcomed a slight kick in the back of my mouth. It was a little off putting. Yet I got used to the taste, addicted even, in that first bowl of endive salad. The amazing woman who I worked for at the time had cut up the leaves into little half circles, doused them with light cream and coarse salt, and tossed them with cubes of avocado. The fatty sweetness of the avocado as well as the sweetness of the cream did not curb the bitterness of the endives, but complemented it very well. We all need a little bitter and a little sweet in our lives, don’t you think? Exactly two years ago (and one year before my first endive salad), I made the big move across the ocean, not knowing if I was really going to stay in Paris or not. My life had always been a big mess… always in stages of collapsing or rebuilding, but never anything stable. The dream of Paris was born in this mess, so maybe that’s why most of my friends told me how stupid it was to try and live here. And it was stupid, but stupidly good with all the great cliches. I fell in love with the city and most importantly, I fell in love with myself (petit copain came later!). Paris is still a work in progress, but a work that I am proud of. Another work in progress? My cooking! After my first endive salad, I knew I had a new mission to fulfill… some sort of “Eat, Pray, Love” journey (but with more focus on the food). Although I had been living in Paris for about a year at that point, I didn’t really know anything about French food. My dinners were mostly recreations of food back home. This was also due to my terrible French and not understanding what things are… At Monoprix (big French grocery chain), I once tried to buy what I thought was salami. This shriveled little sausage was definitely not salami and tasted like a funky, sweaty, dehydrated meat stick someone left in the back of a closet. French products were mysterious to me and trying them one by one seemed too scary. Working as an au pair really changed all of that. If you’re young and want to live in France, I highly suggest working as an au pair or doing “logement contre service”. Working so intimately with a French family is a valuable and unforgettable experience. Coupled with French classes, it’s total immersion into French culture. The mother of the family was always cooking something uniquely French. Her food was fabulous and I started trying out her recipes. Endives are usually cut up into a salad or baked whole with ham and cream. I prefer to use them in a salad (mon copain says baked endives with ham reminds him of terrible French school lunches). 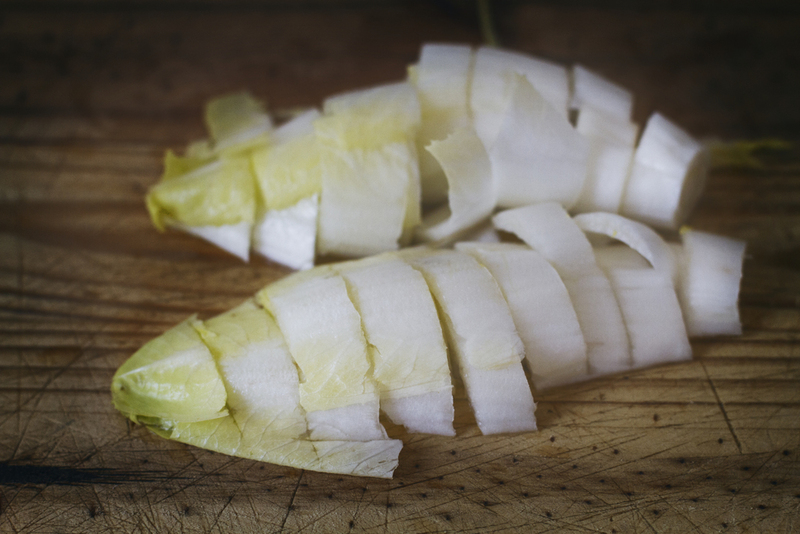 There are many ways to make an endive salad… for me, the easiest, the better! The bitter greens are best paired with a sweeter ingredient, like avocado or a sweet firm cheese, in order to balance out the salad. Walnuts and grapes also go well with endives. If you don’t like the idea of cream, you can opt for the traditional French vinaigrette, which is red wine vinegar, mustard, and olive oil. Shallots and herbs can also be added. The order of these ingredients is very highly debated in French culture. Petit copain says mustard, THEN vinegar, and oil… Other French friends stress on pouring the vinegar and mustard together, then oil. Rules are meant to be broken though! I make my dressing according to what I feel like (or what’s in my reach). Endive leaves are very crunchy and actually refreshing to the palate. They definitely have more nutrients than tasteless, watery iceberg (can you tell my love for this lettuce has faded?). Endives are part of the chicory family, which explains the bitter flavor. French people also eat frisée, another chicory relative, and that is good to eat in salads as well. In France, endives grow mostly in the north. I usually get my endives from one of my favorite vendors, farmers from Picardie who always have a stall at the Bastille Market. Veggies are super cheap here in France, but it’s always best to buy fruits and vegetables when they’re in season. Peak seasons for Endives in France are usually in fall and winter months, from late September to November. Endives are also good during early spring, around April. The vegetables should have yellow tops and smooth (not sticky) white leaves. If there are any blemishes, you can simply peel away the damaged leaves. More on vinaigrette and markets later!! 1. Wash endives, removing any damaged or blemished leaves. Shake off water and pat with paper towel to dry. On a cutting board, vertically slice each endive in the center. Then cut horizontally into little half moons. Throw the endives into your serving bowl. 2. Cut avocado in half. Using a sharp chef's knife, smack the seed diagonally as hard as you can. Twist the seed and take it out. With the skin on, use knife to cut vertically and horizontally (making cubes) into the flesh of each half. Then take a spoon and fish out the avocado cubes. Put the pieces with the endives. 3. Pour crème légère over the salad, until you have covered everything. I usually use up to 1/3 of a very small carton (about 4 to 5 tablespoons or 6cl) and sometimes more when I'm feeling ravenous (like a cream bath!!). Sprinkle as much coarse salt as you like and toss together.